YouTube video: Interview with Akuzawa sensei published 6th June 2017. Aside from free trial lesson applications, enquiries regarding private lessons, seminars, etc., are most welcome. Please use the this mail form for general enquiries. Aunkai is a method of training the body and mind according to the fundamental principles that govern human movement. As the body develops and absorbs these physical principles, it can begin to act in accordance with martial principles. “Technique” is only a product of a body that has been trained to intuitively understand the most natural and efficient ways to move in a martial context. There are many different interpretations of the word “training.” At Aunkai, we first recognize our preconceptions and notions, then attempt to tune the body through certain training methods in order to discover movement of the human body that is in accord with certain principles. Our focus is on the creation and usage of a martial body. 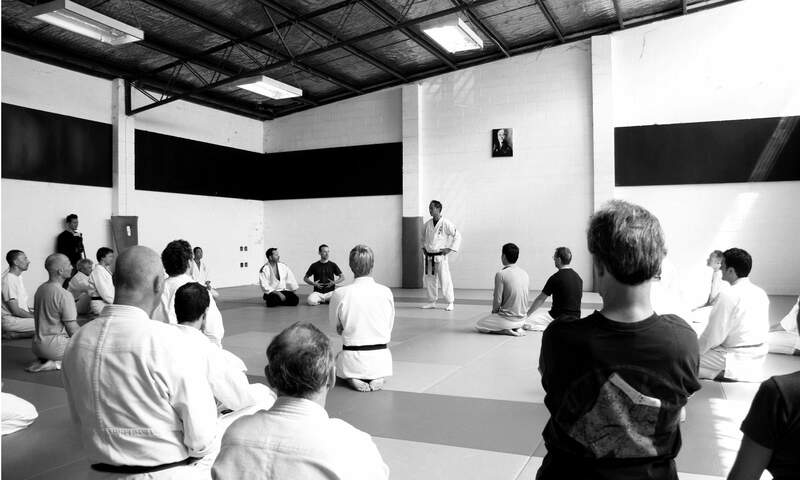 We have members with backgrounds in many different styles such as Karate, Aikido, Muay Thai, MMA, etc. Anyone from any style is accepted here at Aunkai. For more details, see About Aunkai in the main menu. The location for regular practice is Kami-Saginomiya Dai-Ni Apartment Assembly Room, Nakano-ku, Tokyo. 5 minutes walk from Fujimidai station (Seibu Ikebukuro line). Yearly sport insurance of 1850 JPY/year required. Regardless of date of payment, coverage expires at the end of March of each year. Please enquire for entrance fee and class fees. Enquiries about joining classes and trial lesson applications welcome. Please refer to information on contact page. For more information, map and calendar, please see class info on the main menu. There are many who pursue the daily practice of Bujutsu (Budo) as a means to temper their spirit. Training in Bujutsu, or performing Bujutsu Tanren is one way of knowing yourself both physically and mentally. Through the development of a body suitable for bujutsu, forging it in a manner according to the principles that are the foundation of bujutsu, absorbing and learning how to use the body through contact training and finally through the never ending cycle of experimentation/innovation we seek to create a core within our bodies that is “Jutsu.” That is what Tanren is about. Creating Foundation: Realization of principles within the body. Contact Training 1: How to use forces against an opponent. Contact Training 2: Sanda, sparring, etc. Bujutsu: Applications of the above. For more information, please see Classes on the main menu. Applications for trial lessons, requests for information about upcoming seminars and classes, private lessons, etc., are welcome. For more information, please see Contact on the main menu.